Last weekend Marybeth and myself trecked down to St Petersberg, FL to participate in the St Anthony's Olympic distance triathlon; a huge race with over 6000 athletes, top pro and elite field and competative age groupers looking to qualify for the 2009 Age Group Nationals since the race is a regional championship race. We arrived on Friday, me with the fears that my injury may not make it thru the race and MB afflicted with some form of the swine flu. We headed for the race expo and registration. It was a balmy day and the heat started to affect both of us as we bumbled around the expo feeling as if we had both been drugged. We saw a few pros including Terrenzo Bozzone. After talking to the extremely friendly and helpful volunteers, we finally found the swim start and went for our first outdoor swims of the year! The ocean was beautiful and flat-(but not for long.) Saturday, we picked up our bikes from tribike transport( a much recomended outift to ship your bike and you get a free hat to boot!). After a small ride to check the gears, we racked our bikes in the sea of 6000 other bikes. We then headed for another small swim; the surf was a bit bigger today but still better than chilly Walden. The water temp was about 75 so wetsuits allowed thus far. Sunday- race day we got up at the crack of dawn despite the fact that our swim waves didnt go off until after 8:40 and 8:45. We arrived in transition at 5:30 am only to find out that the swim was CANCELLED!!! Evidently the surf and wind was too dangerous and only the pros were allowed to swim;Rumor has it that 2 of the pros were plucked from the swim that morning. After what seemed to be chaos, age groupers were lined up numerically and sent off every 2 seconds, time trial style. MB went off somewhere around 8:45 and me soon there after. We ran from the swim finish into transition where I soon found I was lost in transition. It took me over 2 minutes to find my bike(mind you there was no wetsuit to pull off or anything- I thought for sure one of the over 200 athletes in my "aged" group took it. Finally found the little Guru and was off. The bike course was flat with many turns, very congested at times and windy as well-At one point I thought I was going to fall over sideways. The run, also flat, ran into nice neighborhoods, was well supported with many spectators studded along the course. The wind had calmed down by the run and it was pretty warm out there. All in all, it was a great race despite the fact that it became a duathlon. It's well run, well supported, huge race in a beautiful place; a great opener to the tri-season. MB and I feel we need to come back next year since we didnt get the full experience. Any other takers???? Mike Moran and I raced the Quabbin Reservoir Road Race on Sunday. 63 mile loop with ~5000' climbing and temps were in the 80's. Plan was to ride smart - not hard and I successfully sat in for the first 55 miles, then jumped to cover a break (that went nowhere) at mile 55 and ended up throwing my plan out the window as I found myself pulling the whole damn peleton into the wind for the last 6 miles. After a couple of miles in front I knew I wouldn't have the legs to cover the final sprint - so I tried to break everything up by setting a hard tempo for the last 3 miles to the top of the hill. I sucessfully controlled the race from the front and started the sprint with 200 yards to go. As expected I lost 7 spots due to tired legs and finished 8th overall. Not a bad race, but still kicking myself for tactical errors that probably landed me a handful of spots further down the finisher's list and cost me a payout. Overall a great day of racing. Attached is a view from a finish line. Mary Wrin took third in his division at the Charles River School 5K run in Dover. 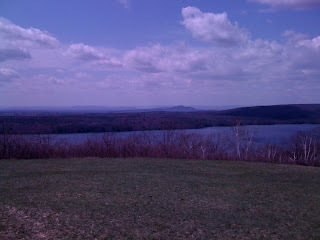 And, I shared overall honors at the Blue Hills 10 Miler w/training parter Dave Hannon of New England Track and Trail. All in all, a great weekend of racing. By the way, a great weekly training event for the bike is the Charlie Baker Time Trial in Concord. BPQ took on the first one of the year, finishing 5th. a huge THANKS to all that were at the BTT tent, or volunteering on the course. I sure needed a boost and was looking forward to seeing the BTT tent...though I swear you moved it farther....and nice to meet new team member Brett in the last couple of miles..if only I could have hung on with you! 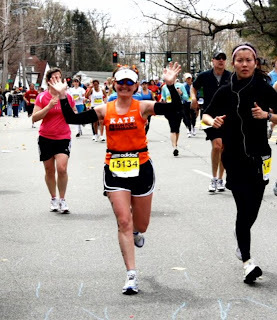 Boston is an amazing race and one you should definitely do if you have the chance.